Whether you're looking for lots of action or a place to relax, Myrtle Beach Resort offers the best of both. This self-contained 33-acre oceanfront paradise offers 4 outdoor pools, 2 indoor pools, a 375 foot Lazy River and wet deck situated on the white sandy beach of the Atlantic Ocean making this one of the most sought-after vacation rental spots on the Grand Strand. Rates do not include Taxes and Service Fees. MINIMUM AGE 25. The place was worth the money spent. My only concern was the bed in the master bedroom has wheels and the locking mechanism is either rusted open and wont lock or just doesnt work other then that its a great place to stay. At our arrival, there was sand on the floor, hte side of the bath in the main room was dirty, there was weeks of dust on the unit the TV was displayed and the microwave was so dirt iwth tomato sauce that I had to use a spatula to scrape it. Towel and hot water did not do the job. We could not take 2 showers one after the other because there was not enough hot water. The unit was supposed to sleep 6 but the mattress of the sofa-bed was so old we felt the springs. We did not used it. The sofa itself was so used and old that our body sank into it when sitting. We barely see the ocean from the balcony. When the air condition stopped we, nor the office, had an emergency phone number to report the problem. The sink in the kitchen did not keep the water. Thanks for your review. We will pass your comments on to the owner of the condo. We apologize for the housekeeping items you mentioned. We're not perfect, but we try to be. As you are fully aware, we jumped on each service call that was generated by you, including the air-conditioning call, within in minutes of the call coming in. The water heaters are not designed to handle multiple showers of long duration without requiring some time to recharge. You were alerted to this when you checked in and advised to spread the showers out. Yes, you booked a "Limited Ocean View" unit, which is priced accordingly. We offered Ocean Front and Ocean View units, as well, but you chose this one. We hope you'll give us another try and take advantage of our Returning Guest Discount next time you plan a trip to Myrtle Beach. Weather was not the best this winter but the location was very good to escape the snow. Lots to do at MB Resort for seniors and families. There are many golf course, restaurants, stores and attractions in the area. One of the hidden gems is the Quarterdeck bar at the beach. The condo is generally in good shape but some things need a little attention (ie: leaky faucets, missing screens/broken screens on balcony, missing dvd remote, broken microwave, and some burner rings on the stove that don't work properly). Myrtle Beach Management (P.Walsh) is a pleasure to work with - very professional, honest, accommodating and quick to please. Looking forward to returning to MB Resort. I thought the condo was clean and had plenty of kitchen utensils. It was located on the very end so the farthest from the beach but was not a bad walk. The resort was even more than we expected! We had the farthest room but still had a good view of the ocean. The room when we arrived was very clean and tidy. The pools were very refreshing and big and there are so many to choose from. When we arrived at the office to pick up the keys, the lady was very kind. The proximity to the beach was a plus. There was also a playground and grills with parkbenches along the resort. The kitchen was very nice and had alot of utensils and pots/pans. The Walmart is right across the street when driving which is a good thing. Besides Walmart, there really arent any close shops nearby. My family and I will definitely stay here again! Overall, we had an enjoyable stay and would definitely come back. The room was in the perfect place for the age group of my children. The room faces the pool and playground, so through the kitchen and bedroom window, I was able to keep an eye on the 2 young teenagers while they were at the pool. The walk to the beach was not at all far. We did not get a chance to use the pool by the beach, or go to the quarterdeck bar. But my kids loved the lazy river pool and my son played basketball at the court quite a few times during our stay. It rained almost 3 full days while we were there, so we spent more time in our rooms then we had planned. The one benefit of the rain was the opportunity to check out the indoor pool. I do think the furniture could be updated, it is very old and the stains and wear are unappealing, we didn't even open the sleeper sofa. The kitchen was fully equipped which was very helpful for our rainy days. One day around 10am, someone from the resort came around to spray for bugs and change the pages in the resort binder, they knocked on the door like they wanted to bang it down. It scared my 2 year old to tears. A suggestion to solve that issue would be a warning before they come around, it was quite alarming and we were still lounging around in pajamas. A general tip to families that are looking to stay here, the water heater is so small, the max amount of time you will get for hot water is 10 minutes, then an hour to wait for 10 more minutes of hot water. There is a magnet on the fridge that states this to guests. We enjoyed our stay but having two small kids the room we stayed in wasn't very convenient. A lot of walking to get to the beach. It was nice having the snack stand at the pool! I was very disappointed in security at the pool. There was a group of teenage boys that kept throwing a football in the pool and hit several people. One parent actually took the football and threw it on the beac b cause they hit his daughter in the face. Security came several times but nothing was ever done. The room is in serious need of updates. The mattresses desperately need to be replaced. We were not as satisfied as we usually are. We went to a few of the hot tubs on different nights and the water was cold. We also got into the heated pool and it was freezing. The main hot tub and the lazy river was always very dirty. The staff in the office of myrtle beach resort (not myrtle beach management) and the staff at the lazy river were very rude. Among other things, we were just not as pleased like we normally have been the other 3 years we have came. Thanks for the review. The maintenance issue was a cracked or broken shelf in the refrigerator. Didn't see the need to replace the part at that time, since it was holding all of the food that could be packed in there. We left you a voice-mail about that. Didn't see any voice-mails from you subsequent to the initial communication about the refrigerator. We stayed in unit A450 this past weekend and had a great time. The unit was very clean and the kitchen was well stocked with all types of dishes. We were coming into Myrtle Beach late and the management company was very accommodating. This gave us the opportunity to have an extra day at the beach. I would stay in this unit again. We felt completely mislead after booking this property and being told the children's pool and larger indoor pool weren't opened and wouldn't be for several weeks. Thank you for the feedback. When you booked, we were under the impression from the Homeowners Association (responsible for maintaining the amenities) that all of the pools would be open by the time you arrived. Unfortunately, we cannot control the HOA's schedule. We hope you did enjoy the many other pools and amenities that were open. We were well looked after by P. Walsh and the Myrtle Beach Management team. The condo is the farthest one from the elevators, right beside the stairways, if you like to walk. The elevator was out of service at least once a week - but there are 2 other elevators in the bldg. Condo has a limited ocean view, but gets the sun in the afternoon. Has all the appliances/utensils to cook in the room. Smaller flat screen living room TV and a DVD player that is hard to use as there is no remote for it. Both bathrooms have built-in hairdryers. 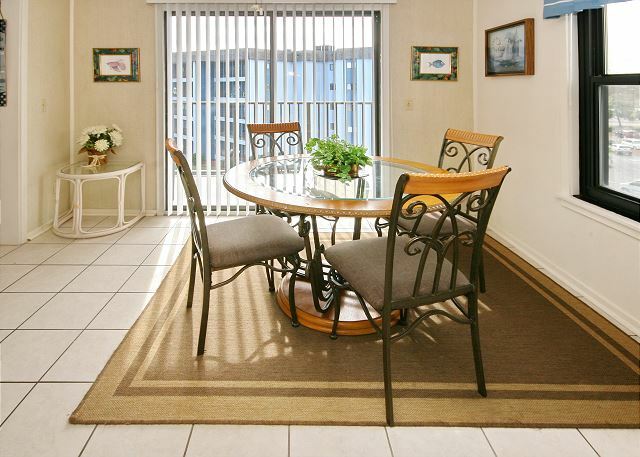 Overall a very nice condo in a nice location in a resort with amenities for all ages. Stayed in Sept 2016 in A450 which is the building closest to the Lazy River, kid's water area, whirlpool and pool. We enjoyed these very much and used the stairs (56 to be exact) often since they were right outside our room and the elevator in the middle of the building some. Rental was clean and well-stocked for the kitchen utensils and cookware. Linens were all in place and starter kit was appreciated. Key pickup was very easy and security was noticeable for the resort. Beach access was easy along with showers after visit. Indoor pool and sauna was very nice. There was a media room, exercise room, kid's playground and tennis courts that we saw but did not use. We would have enjoyed the balcony if the furniture had been a little newer. Overall, we were very satisfied with our stay. My twin sister and I take my twin daughters on a "twin trip" each summer, this year was Myrtle Beach. From where we live in GA, it only took us 5.5 hours to get there and the Myrtle Beach Management team gave us PERFECT directions- Thank You!! We arrived late, so the keys and welcome packet were left in a well lit area for our convenience. From there it was to the Resort! Even at night it was beautiful! The building had 2 elevators, each 1/3 apart, which was great taking steps makes me dizzy and we had several items to take to the 4th floor! Luggage carts were readily available, the room was really nice! The balcony was so nice, that breeze was wonderful!!! The condo was clean, the grounds were clean and EVERYONE was friendly and enjoying family time as if it was home. It was a perfect set up, we found everything we needed to prepare food, coffee, make snacks and chill our water bottles! To have Walmart across the way was an added convenience. We had fresh corn on the cob that was awesome! The lazy river was right outside the end of the unit and a large outdoor pool and beach were easy to walk to and from. We even found we could send and receive mail. Our stay was so nice, we asked for another night and were thrilled to get one more nights stay! I would recommend this condo and resort to others, as well as Myrtle Beach Management, they were so accommodating and helpful. It was as if we had worked together before, they were like old friends. We enjoyed our stay and had no real issues while staying. The condo was right on the beach and with the playground and multiple pools we had a lot to do. The location was also only about 10-15mins away from Broadway at the Beach and the main strip. We got to Myrtle beach early so we wondered if our room/condo was ready early and it was and we were allowed to go ahead in. The condo was really nice and clean. A little outdated but nothing bad. A nice place for my family of 4.